A grain-free version with more nutrition and just as much flavor! 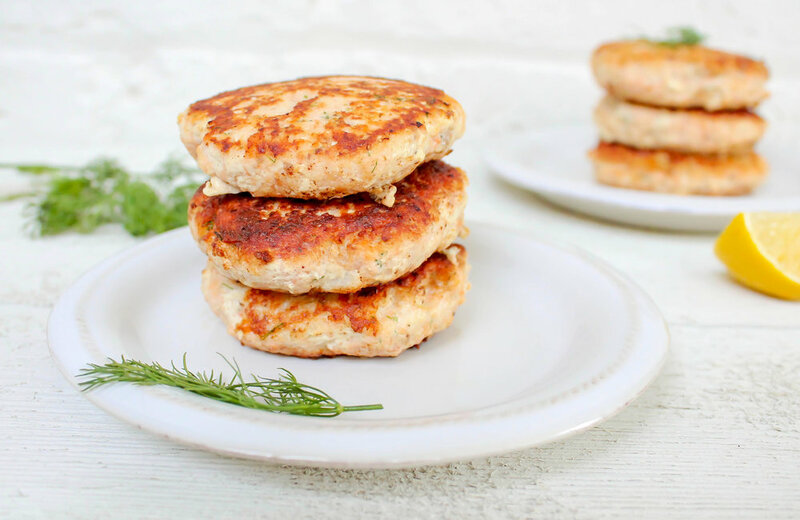 With the combination of salmon and cauliflower rice, these cakes contain protein, fiber and omega-3 fats for blood sugar balance. Cook once and have them on-hand for lunch or dinner throughout the week! Place cauliflower in a food processor until rice-like consistency. Transfer to large bowl. Add salmon to food processor until minced. Add to bowl with cauliflower. Mix well. Incorporate the remaining ingredients and blend. Heat oil in a large skillet over medium-high heat. Using your hands, form patties. Cook 2.5-3.5 minutes per side, or until golden brown. Serve with lemon wedges and tartar sauce if desired!